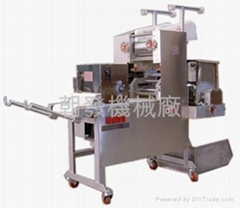 Chao Fa Machine Works Co. is a specialist of professional the noodle making machine and food machines. With 40 years experience in exportation, we always insist on sincerity for high product and service quality as well as team¡¦s ambition to business. We are confident of researching, innovating and developing our products to surpass the market. Our products range from The RESTAURANT TYPE noodle machine( productivity: 25kg/h ) to whole plant for fresh noodle or Japanese noodle or dried noodle equipment( productivity: 800kg/h ), every noodle machine needed is here. We keep on interacting with customers to leverage the services and product improvement, so as to establish a reciprocity for both sides. Our strict quality standard is absolutely worth customers¡¦ reliance. With reputation in market, you may rest assured that our products are high performance machines. 2017 Chao Fa Machine Works Co., All rights reserved.